We make it a point to educate our customers on proper stone care. To keep your stone, tile & grout surfaces looking their best, follow some simple but important care instructions. 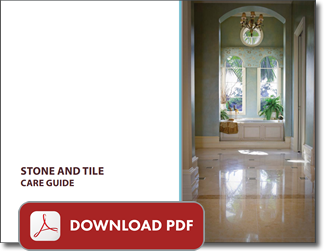 Download our Stone and Tile Care Guide for all of our care tips and information. We strongly recommend you use only quality products designated safe for natural stone. Don't hesitate to ask us for recommendations. Here are some other quick pointers to keep in mind. To minimize or prevent this and other kinds of damage to your natural stone surfaces download our free Stone and Tile Care Guide. Avoid using cleaners that do not specifically state they are safe for natural stone, not only on the stone, but also on items nearby. For example, overspray from cleaning mirrors, or drips or splashes from toilet bowl cleaners can easily damage the stone beneath or around them if they are not specifically stone safe.